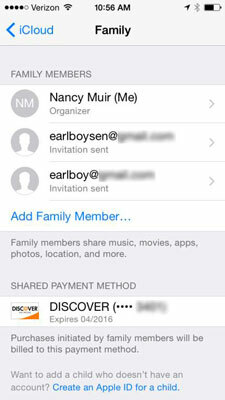 Family Sharing is a new feature on the iPhone 6 that allows as many as six people in your family to share whatever anybody in the group has purchased from the iTunes, iBooks, and App Stores even though you don’t share Apple IDs. Your family must all use the same credit card to purchase items (tied to whichever Apple ID is managing the family), but you can approve purchases by children 13 years old and younger. You can also share calendars, photos, and a family calendar. Start by turning on Family Sharing. Tap iCloud and then tap Set Up Family Sharing. On the next screen, you can add a photo for your family. Tap Continue. On the Share Purchases screen, tap Share Purchases from a different account to use another Apple account. Tap Continue and check the payment method that you want to use. On the next screen, tap Add Family Member. Enter the person’s name (assuming that this person is listed in your contacts) or email address. An invitation is sent to the person’s email. When the invitation is accepted, the person is added to your family. Note that the payment method for this family is displayed under Shared Payment Method in this screen. All those involved in a family have to use a single payment method for family purchases. There’s also a link called Create an Apple ID for a Child. When you click this link and enter information to create the ID, the child’s account is automatically added to your Family and retains the child status until he or she turns 13. If a child accesses iTunes to buy something, he or she gets a prompt to ask permission. You get an Ask to Buy notification on your phone as well as via email. You can then accept or decline the purchase, giving you control over family spending in the iTunes Store.